A devaluation occurs when a country makes a conscious decision to lower its exchange rate in a fixed or semi-fixed exchange rate. A depreciation is when there is a fall in the value of a currency in a floating exchange rate. In general, everyday use, devaluation and depreciation are often used interchangeably. They both have the same effect. – A fall in the value of the currency which makes imports more expensive, and exports more competitive. For A Level economics, it is not absolutely essential to distinguish between the two, but there is a distinct technical difference and using them correctly is good practice. 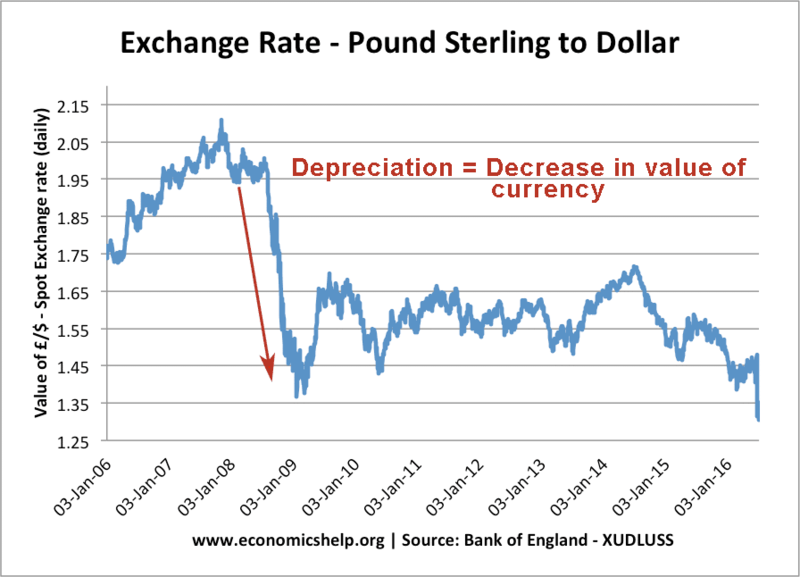 Essentially devaluation is changing the value of a currency in a fixed exchange rate. A depreciation is reducing the value in a floating exchange rate. 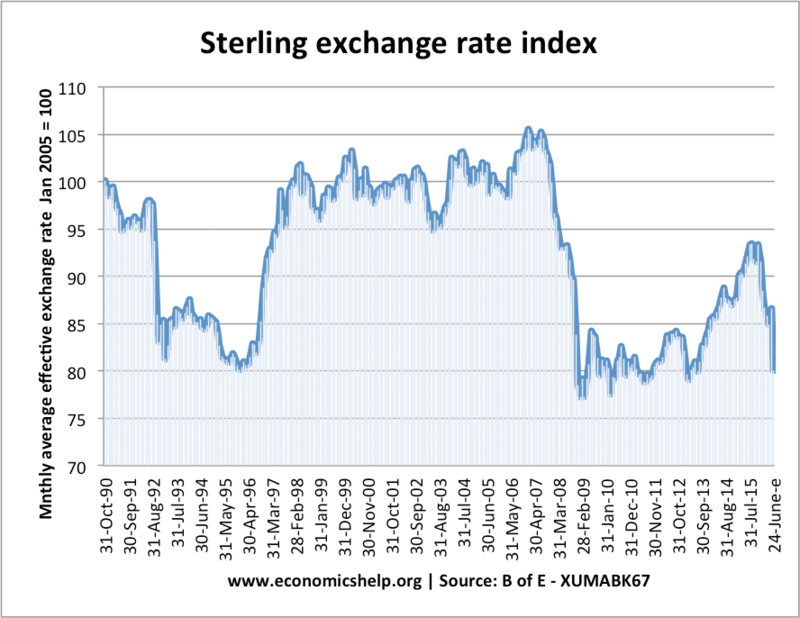 Sterling exchange rate index, which shows the value of Sterling against a basket of currencies. In 1992, The Pound devalued after exiting the Exchange Rate Mechanism. A devaluation is when a country makes a conscious decision to lower its exchange rate in a fixed or semi-fixed exchange rate. Therefore, technically a devaluation is only possible if a country is a member of some fixed exchange rate policy. For example in the late 1980s, the UK joined the Exchange Rate Mechanism ERM. Initially, the value of the Pound was set between say 3DM and 3.2DM. However, if the government thought that was too high, they could make the decision to devalue and change the target exchange rate to 2.7DM and 2.9DM. In 1992, they left ERM as they couldn’t maintain the value of Pound. For example, After Brexit vote of 2016, the value of Pound Sterling fell 15% because investors downgraded the long-term economic outlook of the UK. In everyday use, people talk about a devaluation of Sterling/Dollar when, technically speaking, they mean a depreciation in Sterling/US Dollar.